Duke forward Rodney Hood, who transferred from Mississippi State, is the Blue Devils' second-leading scorer this season. Hundreds of college basketball players elected to switch schools this past offseason for varying reasons: playing time, coaching changes, graduate students, the list goes on. Many transferred "down" — a power conference player moving to a mid-major or lower-tier power conference program, often times for the sake of playing time or for a better fit system-wise. Others took the opposite approach, moving from the Division-I shadows (relatively speaking) and onto bigger stages: Duke, Arizona, Florida, Georgetown. Under the wrapping paper: The Mississippi State transfer sparked plenty of intrigue last season when rumors of him playing well in Duke practices surfaced, and he’s lived up to the hype, providing a formidable one-two punch with superstar freshman Jabari Parker this season. The Blue Devils’s offense has flourished with Coach K’s newest group — ranking second nationally in efficiency — and Hood has quickly become a formidable No. 2 option in the college game, playing the second-most minutes on the team and taking 23.6 percent of available shots. The 6-foot-8 redshirt sophomore has hit those shots, too, pouring in nearly 19 points per game with elite efficiency. He’s hitting more than 60 percent of his field goals, 45 percent of his 3-pointers and 83 percent of his free throws. Only 22 players nationally boast a higher true shooting percentage. Hood’s versatility has given Coach K some freedom to tinker with lineup sizes this season, and though the Blue Devils have been atypically porous on the defensive end, the offensive is clicking just fine. Under the wrapping paper: Perhaps no other coach in the country takes incoming transfers and blends them seamlessly into his system better than Altman, who brought in Olu Ashaolu, Davoe Joseph and Tony Woods to be primary contributors in 2012 before featuring Rice rebounding guru Arsalan Kazemi during last season’s Sweet Sixteen run. He’s doing it again this season. The undefeated Ducks top three scorers are transfers, with Joseph Young, a 6-foot-2 addition from Houston, leading the way with 19.3 points per game. Mike Moser (UNLV) and Jason Calliste (Detroit) are also averaging double figures for a team that ranks seventh nationally in offensive efficiency. The transfers not only making Oregon one of the preeminent threats to Arizona in the Pac-12, but they also helped bridge the early-season gap for Altman’s roster as sophomores Dominic Artis and Ben Carter served suspensions. With Young, Moser and Calliste on board, Oregon boasts one of the deepest rosters around. Under the wrapping paper: The Wildcats’ coaching staff has landed a top-five recruiting class each of the past three years, including the highly-regarded ’13 class bringing in immediate difference-makers Aaron Gordon and Rondae Hollis-Jefferson, but it needed someone to deliver the ball to all that talent. Enter T.J. McConnell, a 6-foot-1 Duquesne import who was efficient in his first two collegiate seasons, if not a star. Now, he’s the starting point guard of the No. 1 team in the country, dishing out a top-50 assist rate nationally, refusing to take on too many shots — unlike Xavier transfer Mark Lyons did last season for Miller’s group — and, for the most part, playing within his means. In the Wildcats’ best win of the season (Duke), McConnell finished with 10 points, eight assists and six rebounds. That’s really all Miller needs out of him for his team to be a national frontrunner. Under the wrapping paper: In his sophomore season at Tulsa, Clarkson became the go-to scorer for coach Doug Wojcik, averaging 16.5 points with a 54.9 true shooting percentage. But that 2011-12 Hurricanes team went 17-14 and subsequently fell apart: Wojcik was replaced by Danny Manning and the team’s promising backcourt (Clarkson, freshman Eric McClellan) are now playing in the SEC. And while McClellan has shown his potential as a volume scorer this season at Vanderbilt, Clarkson is emerging as a star in Frank Haith’s system. The 6-foot-5 point guard has done a more-than-admirable job in replacing former All-American candidate Phil Pressey, taking on more of a scorer’s role averaging 19.4 points and improving his true shooting percentage to 59.8 while using up 28.7 percent of the Tigers’ possessions. The Tigers are balanced and undefeated, and they’ll need Clarkson to continue to pay well in order to challenge for a conference title. Under the wrapping paper: The 6-foot-8 sophomore missed the first two games of the season while serving a suspension, but the practice rumor mill reports have some legs. Finney-Smith, the athletic Virginia Tech transfer who sat out last season but (much like Rodney Hood) earned praise from teammates and NBA scouts from his work in practice, is playing starter’s minutes off the bench for Billy Donovan’s team, primarily for his work on the boards, where the Gators have struggled at times this season. Finney-Smith is grabbing a team-high 13.3 percent of available offensive rebounds and 22.2 percent of defensive rebounds through eight games. He probably should not be shooting the ball quite so often, but he’s become a source of immediate production for one of the most efficient teams in the country. Under the wrapping paper: The long-winded and oft-publicized transfer of Uthoff from Wisconsin to another Big Ten school, Iowa, was worth it in the end for the Hawkeyes. McCaffrey’s staff — one which recruited Uthoff originally out of high school — has slow-played Uthoff into the rotation thus far, but he grades out as one of the most efficient players in the country. He’s a vital piece to Iowa’s strength on the boards (top-75 nationally in offensive and defensive rebounding rates) and his 1.4 block per game has helped the Hawkeyes hold opponents to 42 percent shooting (eFG) so far. While not quite an immediate star, he’s been worth the wait for a program looking to break into the upper echelon of the nation’s top conference. Under the wrapping paper: The 6-foot-6 import from Denver became one of the few immediate waiver transfer recipients granted by the NCAA this past offseason, a much-needed backcourt piece for the 9-1 Bears after losing their fair share of transfers, too. 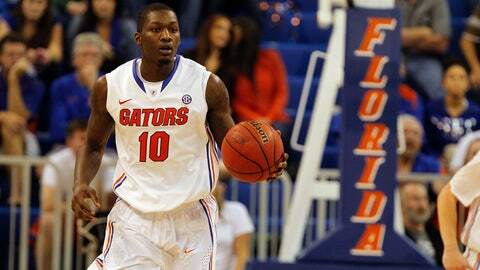 Dorian Finney-Smoth, a transfer from Virginia Tech, has added another athletic forward into the Gators’ formidable mix. Serving more as a glue guy to start the season, O’Neale is taking just 9.5 percent of available shots, but his true shooting percentage is top-15 nationally and he’s playing starter’s minutes for an annual tourney participant. During Baylor’s Maui Invitational run, the junior scored double-digit points against Chaminade, Dayton and Syracuse. He could play a vital, but quiet role in the Big 12 race. Under the wrapping paper: The most troublesome hurdle in Smith’s development has been cleared through the early portion of the season, as he’s played more than 20 minutes per game, scoring at least 10 points in seven of the Hoyas first nine games. The fact that he’s capable of handling such minutes after the weight issues he encountered at UCLA is a major plus for both Smith and his teammates — because he’s played very well when he’s on the court. Starting with the season-opening loss to a very good Oregon team on a neutral court — Smith scored 25 points in 27 minutes and grabbed four offensive boards — Georgetown has appeared capable of overcoming the loss of NBA top-five draft pick Otto Porter. Of Big East players with a 24 percent usage rate or higher, Smith boasts the highest offensive rating. Under the wrapping paper: Drake (7-3) could use Rayvonte Rice back right about now. After two seasons of rather underwhelming production on two bad teams, Rice’s year of being tucked away in the Illini program has worked out quite well for John Groce’s team. Illinois now features one of the premier backcourt scorers in the Big Ten in Rice, who has scored in double figures in every game this season, including 25 points against UNLV and 24 versus Georgia Tech. Most importantly? His efficiency has gone through the roof. After taking more than 30 percent of his team’s shots during his sophomore campaign at Drake, Rice has cut back a bit on his usage whole improving his offensive rating by nearly 30 points (hint: huge leap). His shooting percentages, offensive rebounding and assist-to-turnover rates have all improved as well. It’s not a stretch to think he could be an All-Big Ten performer. As for the other present Groce received, Illinois State transfer Jon Ekey was able to play immediately as a graduate transfer and is logging starter’s minutes while providing an additional outside shooting threat to a mediocre shooting offense. Under the wrapping paper: Avila might be the strangest story of the bunch. After becoming an immediate star for Navy — even earning Patriot League Rookie of the Year honors — he took the less-traveled road by spending his redshirt season away from college basketball at South Texas College. Instead of practicing for a year with future teammates, he played in men’s leagues and worked out with his AAU coach. When it came time to transfer to Colorado State, he was one of the biggest transfer wildcards on the market. The wildcard is paying off for Larry Eustachy’s program, one that is desperately trying to pick itself back up after losing five senior starters from last season’s NCAA tourney team. Avila, a 6-foot-7 forward who averaged 15.9 points as a sophomore at Navy, has emerged as the go-to scorer for the Rams, taking a team-high 28.8 percent of available shots while posting an offensive rating of 120.8, the ninth-highest mark nationally among active players. If Colorado State, which can not stop anybody defensively right now, is going to climb into tourney consideration during Mountain West play, Avila will have to carry the load. 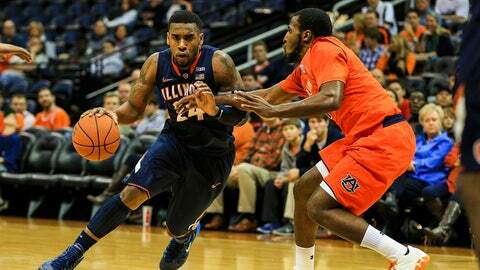 Illinois guard Rayvonte Rice has emerged as one of the top scorers in the Big Ten this season.